You probably haven’t noticed that I’ve been neglecting my blogging duties lately. If you have, then I apologize. I haven’t been tweeting as much, nor have I been attending local beer events that I had been invited to. Well, there is a reason for this and that is my sweet grandfather (affectionately referred to as “Bapa” by his grandchildren and great-grandchildren) passed away on Sunday, April 29, 2012. 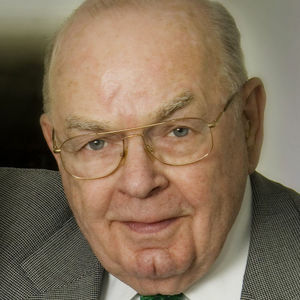 He was quite an accomplished man: a lieutenant in World War II, a leader in the real estate appraiser field, and a genuine, funny individual who was loved by all who knew him. This is the first death that I’ve ever had to really deal with; the first of a close family member, anyway, and I’m not handling it very gracefully. The day after his death, I had to leave work early since I could not concentrate or stop crying. I left work and headed to Evanston where my parents now reside. I needed my mommy. And a beer. My mom and I went to Prairie Moon for lunch and shared a piece of pecan pie for dessert, one of Bapa’s favorites. I was talking to my mom about how to come up with beer recipes and looked down at that piece of pecan pie. The gears started turning and thought that maybe, just maybe, I could turn the flavors of my grandfather’s favorite dessert into a beer. I knew it was tricky utilizing nuts in beer; there are oils that can destroy the head of the beer. I did some research and put a basic, Nut Brown Ale recipe together that would include some ingredients popular in pecan pie. The grain bill would consist of Maris Otter, Chocolate, and Brown malts, as well as two cups of toasted, crushed pecans. I would then add 12 ounces of molasses and a half pound of brown sugar to the boil. I worked out the recipe and bought all of the ingredients before heading to Philadelphia for the memorial service. That way I could get up early on Thursday, May 10th to brew Bapa’s Pecan Pie Brown Ale. I was born and raised in the suburbs right outside of Philadelphia and the majority of my extended family still resides there. My grandparents live(d) in an assisted living facility in Media, Pa, about a half hour drive from Center City. If Media, Pa sounds familiar to you beer geeks out there it’s because the Iron Hill Brewery in Media, Pa won two gold medals at the World Beer Cup last week, as well as the top honor of Champion Brewery and Champion Brewmaster, Small Brewpub. So I was faced with a dilemma after the hubby and I got off the airplane in Philly: spend time with grieving family members or head to Iron Hill. Well, family wasn’t expecting us until 5pm, and it was barely 3pm when we finally got the rental car. I think this was a no brainer. At Iron Hill, we sidled up to the bar to take a look at the beer menu. Iron Hill is a small brewery chain in Delaware, New Jersey, and Pennsylvania. The beer menu is organized in much the same way as a Rock Bottom Brewery in that there are the house beers that all the Iron Hills have on tap and then specialty brews where the brewmaster at each location can stretch their creativity and craftsmanship. The specialty list at the Media location was insane; there were about 15 beers available from an award-winning Maibock to Berliner Weisse to IPA to a coconut Belgian single. I asked the bartender if they did flights so that the hubby and I could sample all of the current offerings. He said yes, but then just started pouring us tasters of pretty much any beer we wanted to try, completely free of charge. Some of the highlights were a bourbon barrel aged porter served on nitro; an English-style barleywine; the Maibock (both regular and chili pepper versions); and the English-Style IPA. The beers were truly fantastic and now I know why the head brewer, Bob Barrar, is Iron Hill’s most decorated brewer. We ended up getting two growlers (the Maibock and the IPA) to take and share with our family members. The following day, we spent some time with family but, at my mother’s pleading, the hubby and I decided to do a mini beer tour of downtown Philadelphia. Our first stop was the Noddinghead Brewery that is housed in a second-story walk up. 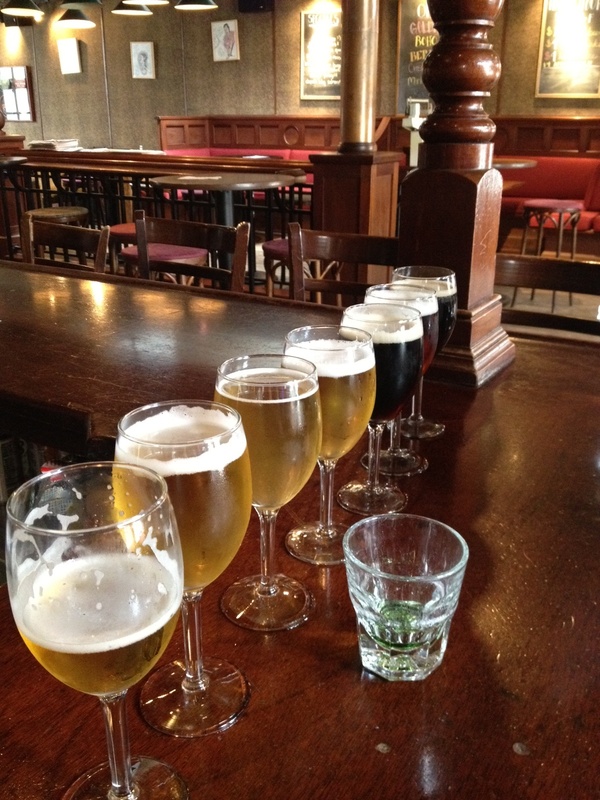 While they do serve food, we opted to just do a beer tasting since I had my heart set on eating lunch at Monk’s Café. And hubby could already taste a Philly cheesesteak from Jim’s on South Street. We again sat at the bar and inquired about a flight and the bartender poured us 7-ounce samples of each of their current offerings. The majority of the beers at this establishment were of the session beer variety; only two of the seven or so beers were above 5% alcohol. There was a nice hoppy, refreshing, golden ale called Goldi-Hops. Ich Bin Ein Berliner Weisse was light, tart, and crisp. There was a hoppy brown ale that was tasty but had a thin mouthfeel that I didn’t care for. My favorite of their beers was Crosby Tears, a strong ale fermented with Belgian yeast that imparted a slight banana flavor. This was delicious and, being me, I’m not at all surprised that the strongest beer on the menu was my favorite. 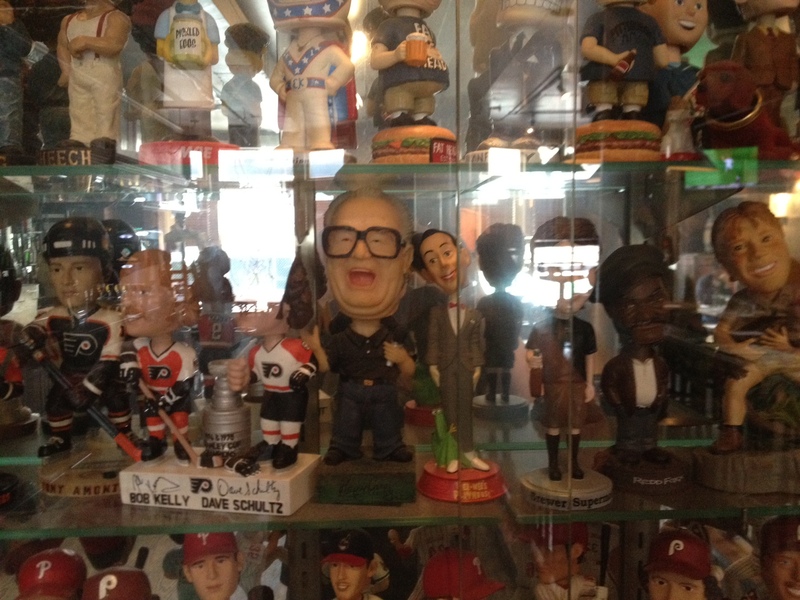 Noddinghead Brewery had quite the extensive collection of bobble heads. After working up an appetite tasting the beers at Noddinghead, we decided to walk the half-mile or so to Monk’s Café, a Belgian beer bar institution. I have heard nothing but amazing things about this place and could not wait to have a Belgian beer paired with a pot of steaming mussels. Our plans were almost thwarted, though, because a movie was being shot on 16th street. Hey movie producers: probably not a good idea to shoot an action scene during lunch hour in a major business district. There were plenty of angry lunch-goers who didn’t listen to the crowd control and just crossed the street. But that just made it take even longer for the rest of us. Oh, well. It just added to build up the anticipation of finally dining at Monk’s. Monk’s Café is a pretty unassuming spot; it is just a storefront on a stretch of street in Philly. But when you get inside you feel as if you are in a bright café in the Belgian countryside. Not that I would know what that’s like, I’ve never been. We grabbed seats at the front bar (there is another bar in the back) and began looking over the beer menu. My dilemma here is that I was looking forward to having a Belgian sour ale but they had Russian River Pliny the Elder on tap! I had to get that; how could I not? So the hubby ordered a Monk’s Café sour and we shared both of the beers with each other. One of the many advantages to having a hubby. We ordered a huge pot of mussels that also came with crispy frites and amazing bread. I was happy. I’m going to skip over the part where the hubby and I walked down South Street to get him not one but TWO cheesesteaks from Jim’s and go right to Yards Brewing Company. Yards is located near Penn’s Landing, a waterfront location along the Delaware River that houses concerts and other summertime activities. It is a production brewery but it has a quite extensive tasting room that, in addition to beer flights, sells pints, growlers, tshirts, and snacks. There are also bar games so it is a place to come, drink beer, and hang out. I had never had a Yards brew before so the hubby and I opted to each get one of the two available flights. 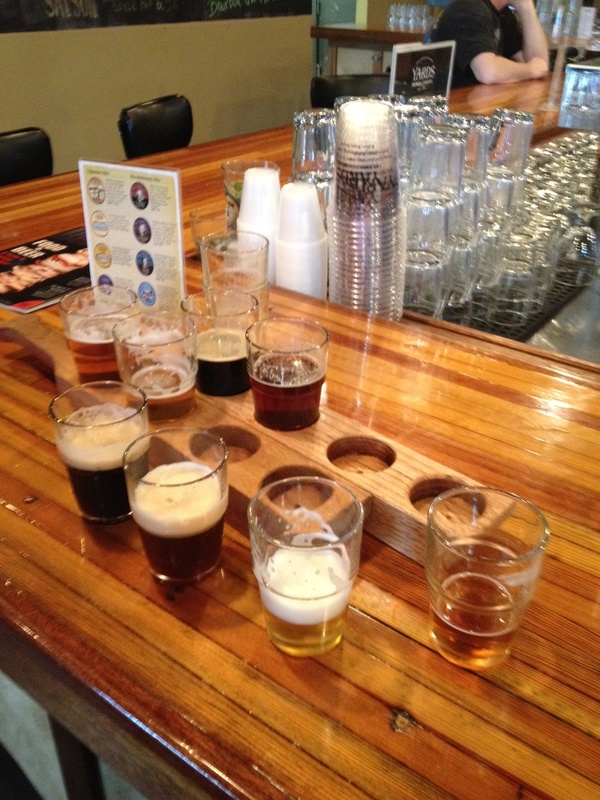 The first flight included the standard beers and the second flight was of their revolutionary brews. 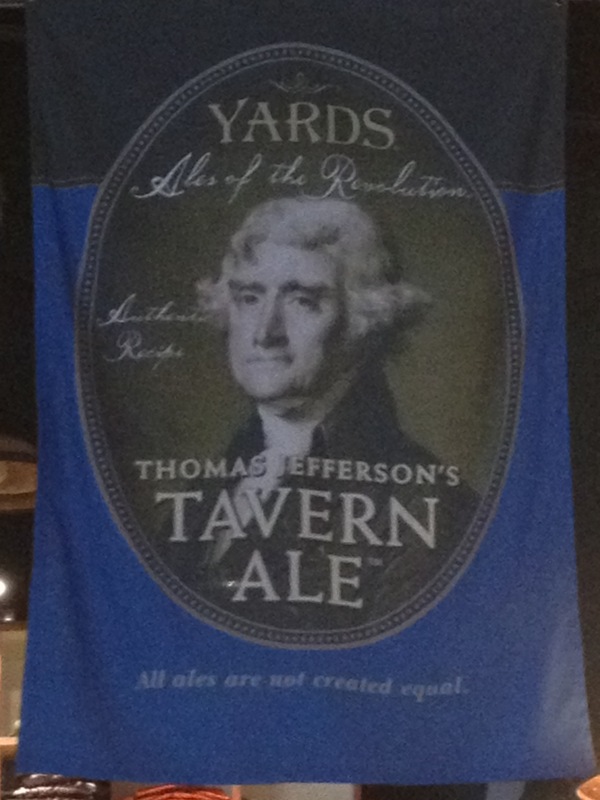 My favorite was the Thomas Jefferson Tavern Ale, a rich, malty, slightly hopped strong ale replicating one of Jefferson’s own beer recipes. 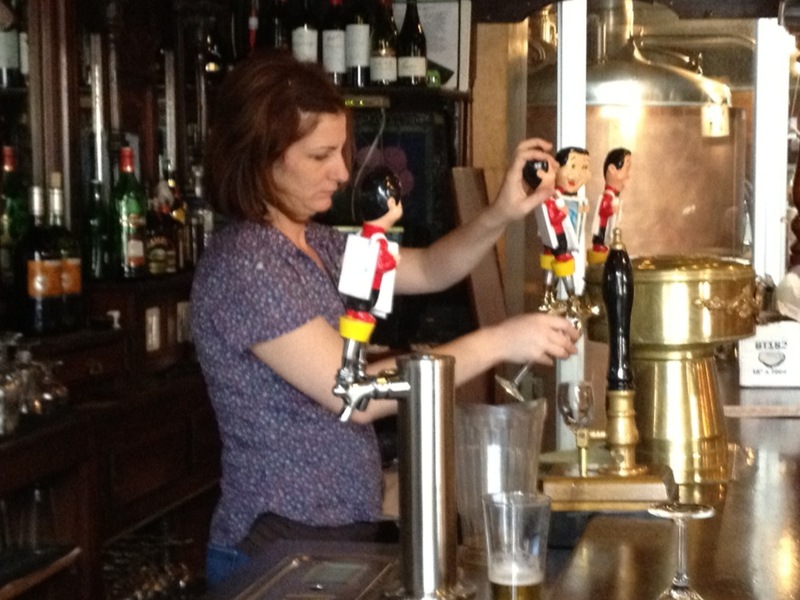 Some other tasty brews were the Tavern Porter and the Saison, one of their one-offs. Delicious! Seriously, if you are in Philadelphia, you need to check out Yards. And that brings us back to Bapa’s Pecan Pie Brown Ale. We returned from Philly yesterday and, congruent with my original plans, I woke up at around 6am to start the brew day. While I typically brew with my hubby, I wanted to brew this beer by myself, both as a way to show that I can brew without an assistant brewer, and because it is my way to mourn my grandfather’s passing. I thought about him a lot during this brew day and his integrity, perseverance, and organization influenced and motivated every action I made. Miss you, Bapa. This beer’s for you! What a sweet and loving dedication to your grandfather! It sounds like he’ll be sorely missed by many. May your beer brewing of Bapa’s Pecan Pie Brown Ale help ease the heartache that comes thru so clearly in your writing. Peace. It was quite a cathartic experience today. I am glad I was able to travel to aphilly to spend time with family and concentrate on the good times. Cheers! What a lovely way to honor someone who meant so much. I’m not sure if I can think of a nicer tribute. Wishing you and your family peace and joy. Thanks Marilee! It’s been a rough week. Hopefully this beer lives up to my grandfather’s reputation. Having lost both of my grandpas this March, I read your post with special interest and a certain kindredness (hmmm, is that a word?) of heart. 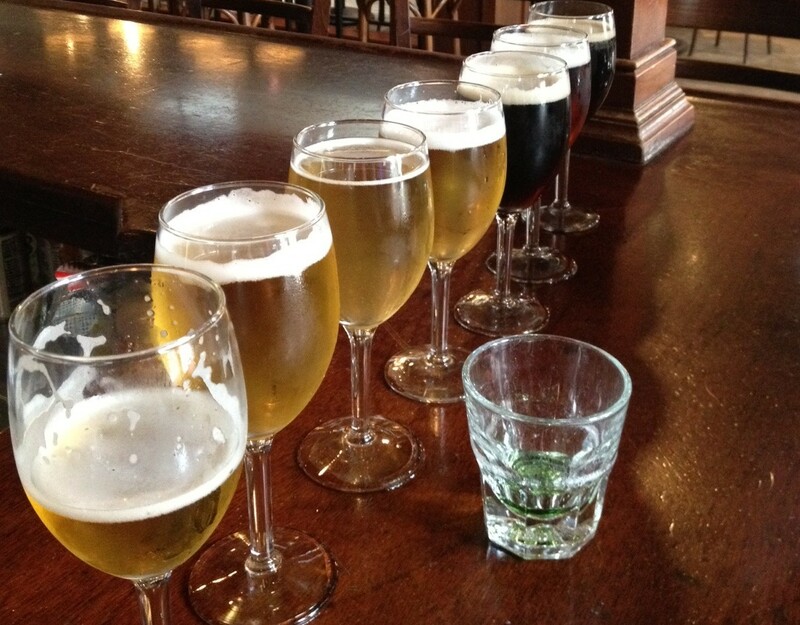 Was great to read your reports, too, of some of my favorite beer drinking memories. 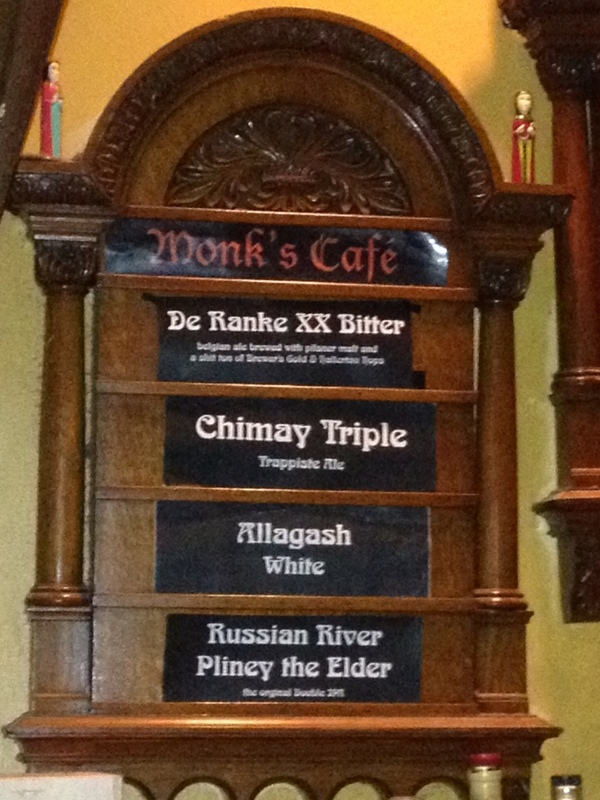 That Monk’s sour is well worth the trip IMHO. Look forward to hearing how the Bapa’s Pecan Pie Brown Ale turns out. Peace to you. Thank you Averie! It’s a weird feeling losing someone that has been a part of you your whole life. I hope the beer turns out ok!